the earthquake the building can resume normal operation. Keywords: earthquake, PBSD, time history analysis, base isolator. (IJCIET), 10 (1), 2019, pp. 285–296. material to get certain rigidity . thickness 20 cm product of Bridgestone were used) . repair costs after the earthquake according to FEMA 273.
to study the seismic response coefficient until reach inelastic condition (reduce factor up to 8). Where: G = shear modulus of elastomer (MPa). A = section area (mm). tr = total thickness of rubber (mm). D = maximum horizontal displacement (mm). γ = maximum shear strain. = damping coefficient for DBE. investigation data as illustrated in Table 2. Seven ground motion records list in Table 3 and illustrated in Figures 4(a) to (n) . Equation (9) is shown in Table 4 . 2. Determined Importance factor (Ie). 3. Site specific ground motion procedure. 4. Determined Site soil class (SA-SF). 5. Determined Site coefficient short and long period (Fa, Fv). 6. Design spectral acceleration parameter (SDS, SD1). 7. Determined Seismic Design Category (A-F). 8. Determined Seismic response modification coefficient. 9. Determined base isolator properties. 10. 3D dynamic non-linear time history analysis. 11. Base isolator PBSD method. : 12 storey (43 m). : 60 x 60 cm. : 40 × 60 cm. : 50 × 70 cm. : 25 × 35 cm. : HDR HH090X4S (Bridgestone product). R 8.0 were calculated and illustrated in Figures 6(a), (b), 7(a), and (b). costing during the earthquake, after that the building can be use and operate. because level of damage is 50% and need to repair more than 30 days. to make this research possible. New Masonry Buildings,” Engineering Failure Analysis, Elsevier, V. 90, Aug. 2018, pp. Environment, V. 172, 2017, pp. 71–82. Proceedings, American Institute of Physics, USA, V. 1978, 2018, pp. 1–4. Institute of Physics, USA, V. 1906, 2017, pp. 1–4. 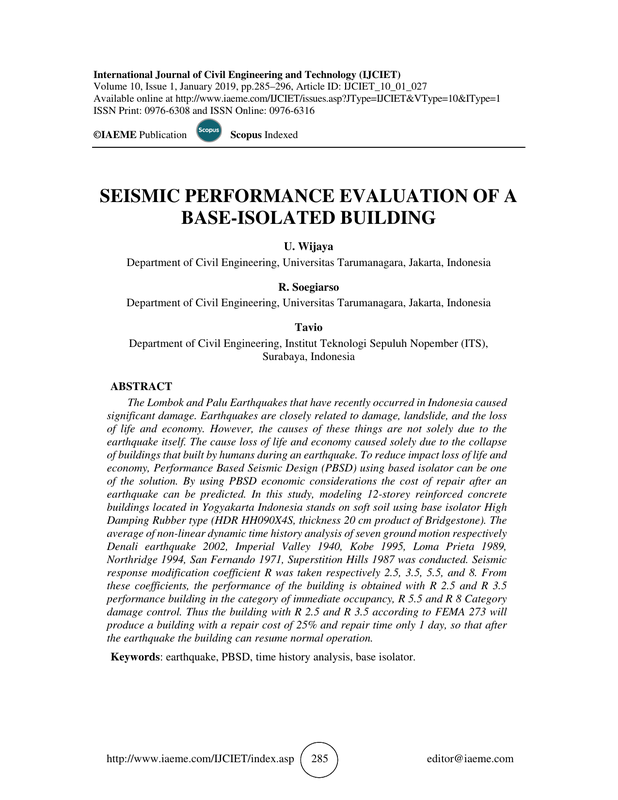 in A Highly Seismic Region,” International Journal of Applied Engineering Research, V.
11, No. 14, 2016, pp. 8253–8258. Structures, ASCE/SEI 7-16, Reston, Virginia. John Wiley & Sons, New York, 1999.
and Other Structures and Accompanying Commentary and Maps, 2006. Shape Factors,” AIP Conference Proceedings, American Institute of Physics, USA, V.